If you are in a severe financial crisis, bankruptcy may be your only option. Bankruptcy has the potential to offer debtors a new financial life, free from debt. However, bankruptcy can have both positive and negative financial ramifications. During both the course of your bankruptcy case and for years afterward, the effects of your bankruptcy filing will force you to make adjustments in your financial life. Chapter 7 and Chapter 13 are your two primary bankruptcy options as a consumer debtor. The immediate effects of your bankruptcy will vary substantially depending on the chapter you choose. If you file Chapter 13, you'll have to repay some or all of your debt over a period as long as five years. You begin by submitting a proposed payment plan to the court when you file your case. Upon approval, you must begin making monthly payments. You can avoid a Chapter 13 payment plan by filing Chapter 7 bankruptcy, if you qualify. However, you might have to surrender some of your most valuable assets. Bankruptcy exemptions allow you to protect some of your assets, but the specific exemptions vary among the states. Typically, you can protect items like tools of your trade, household furnishings and your retirement accounts. Some states, including Texas, have an unlimited exemption for homes, but others, like Alabama, protect only up to $15,500. Cars are often exempted to only a few thousand dollars. If you can't exempt an asset, the court will take it and sell it. Even if you can exempt your property from seizure by the court, you may still face foreclosure or repossession if you cannot continue to make payments on your property or car. A bankruptcy can buy you some time to get things straightened out, but it won't allow you to keep your car or house if you can't get back on track and pay for them. The financial fruits of your bankruptcy come at the end of your case, in the form of the bankruptcy discharge. You'll get your discharge after you complete your Chapter 13 payment plan or just a few months after you file your Chapter 7 case. In both cases, any unpaid debts that were included in your bankruptcy are no longer your responsibility. Your creditors cannot ever pursue you for repayment without breaking the law. Some debts do survive bankruptcy, such as child support, alimony, and most taxes. You will know which debts the bankruptcy won't discharge before you even file your case, as they are clearly designated as priority debts on your bankruptcy petition. Filing bankruptcy is one of the worst things you can do to your credit score, dropping it by more than 200 points in some cases. However, your score might not decline much, or could possibly even rise, if you file bankruptcy after a long string of delinquencies. Your payment history, which makes up 35 percent of your total FICO score, includes both late payments and public records, such as bankruptcy. If your score is already trashed due to a spotty payment history, adding a bankruptcy won't make a dramatic difference. Since the next largest portion of your credit score is the amount of debt you owe, at 30 percent, the discharge of debt you receive in bankruptcy could actually help this part of your score. A bankruptcy will remain on your credit report for 10 years, in the case of a Chapter 7 bankruptcy, or seven years, if you filed Chapter 13. Getting new credit can be difficult while your report still reflects a bankruptcy. Any new credit you obtain is likely to carry higher interest rates. Technically, it is against the law for an employer to fire you, lower your pay or otherwise alter your employment just because you filed bankruptcy. If your employer has other reasons for firing you, however, the fact that you filed bankruptcy won't protect you. The rules change a bit when you apply for a new job. 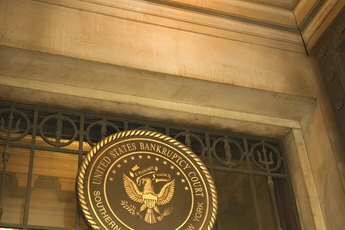 The law prohibits any government agency from considering a bankruptcy when hiring you. Private companies, however, aren't affected by this law. A private employer can refuse to hire you if there is a bankruptcy on your record, especially if the position will require you to handle money. At the very least, you may have to explain the bankruptcy if a potential employer runs a credit check on you as part of the hiring process. 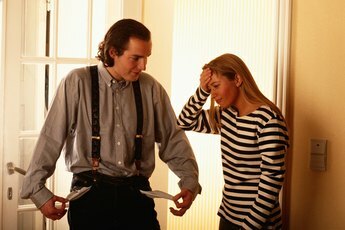 TheBankruptcySite.org: Will Bankruptcy Stop Foreclosure? Nolo: Will Bankruptcy Affect My Job or Future Employment? How Long Does It Take to Complete Bankruptcy? Is it Better to File Bankruptcy or Deplete a 401(k) to Prevent Bankruptcy? What Happens When Bankruptcy Comes Off Your Credit Report? 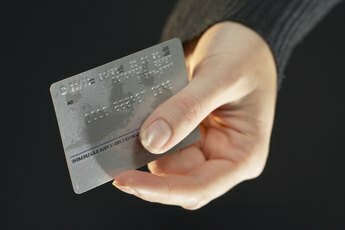 Can You Just Declare Bankruptcy on Your Credit Card Debt?